MGOC Regalia - You can obtain information on maintaining and improving your MGs and the Club offers a full range of Regalia, Parts and Accessories from our Online Shop or by mail order, telephone or we welcome visitors to the Club Shop based at our Headquarters in Swavesey. MGOC Workshop - Based at the MG Owners' Club Headquarters at Swavesey, near Cambridge, the Club Workshop is an MG specialist garage offering a complete range of services to meet all your MG requirements. MGOC Spares - MGOC Spares supplies original parts and accessories for MGA, MGB, MGC, V8, RV8, Midget, MGF, MGTF, ZR, ZS, ZT. 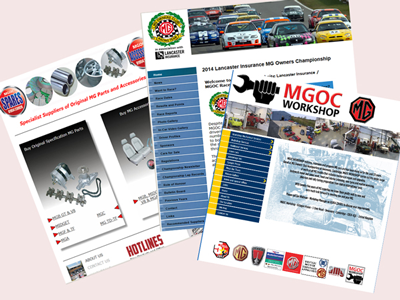 MGOC Race Championship - The MGOC race championship in association with Lancaster Insurance Services, offers exhilarating Club racing both for the competitor and spectator alike. As a result of our association with the British Automobile Racing Club, this MG motorsport series visits many prestigious race tracks throughout the UK. MGOC Travel Club - One of the major benefits of being an MG Owners' Club member is that you are entitled to the savings and the service that the MGOC Travel Club provides. Whether you want to take your car abroad on your own, in a group, or on an MGOC organised tour then you can make substantial savings by booking through the MGOC Travel Club.